The divorce rate in America plateaued about four decades ago and has been sitting somewhere around 50% since then. Some people who read that may errantly believe that there is a 50-50 chance that their marriage will make it. Not so! Here are the real divorce rate numbers. For first time marriages, about 41% end in divorce. This includes the more vulnerable marriages that involve children before marriage, addictions, mental health issues, late teen marriages, no faith, no college education, marriages in poverty, and other high risk situations. That means that there is at worst a 60% chance your marriage will not end in divorce. For second marriages, about 60% end in divorce. These is still a 4 in 10 chance your marriage will make it. For third marriages, about 73% end in divorce. The odds are really stacked against you statistically speaking. Less than 30% of couples who are marrying for the third time will avoid ending in divorce. We love duct tape. You can use it to fix almost anything. And what you can’t fix permanently, you can almost always fix temporarily with enough duct tape. 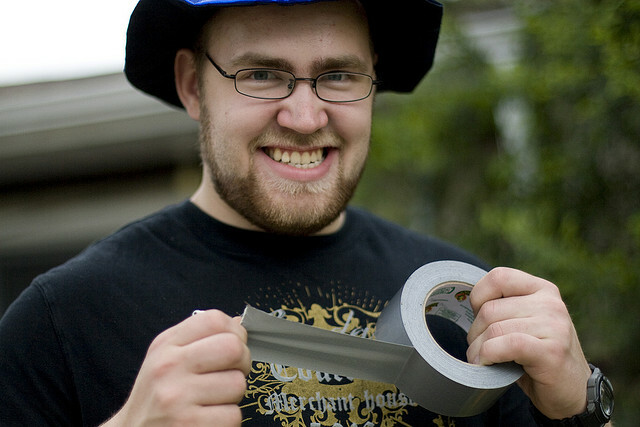 You may have noticed that duct tape works best if you leave it after applying it. Take a piece of duct tape and apply it, then pick it up again and re-apply it. You will find that it doesn’t work as well the second time. And the more you pick it up and re-apply it, the more it loses its sticky factor. We see marriage relationships having the same issue. During the first marriage, each heart is doing its best to trust and connect. The marriage relationship seems to work and the couples hearts stick together well. If the marriage ends, hearts hold back some of their trusting connection effort. That means that the second marriage has less stickiness. And it is even less sticky in the third marriage. We hold back and refrain from fully committing our heart in an effort to not get hurt again. The number one reason you should stay and work it out is because you know what you have in this marriage. The chances of your creating the marriage you really want are stronger in this marriage, than if you quit and end the marriage and try to build it right with someone else. Every time you quit the relationship instead of working it out, you decrease your chance of ever having the marriage that you have always hoped for. Unless you are in a dangerous relationship, we want to encourage you to work hard to move your relationship toward the healthy marriage you deeply want. It will take time and hard work, but it will take time and hard work to go through a divorce as well. It might cost you financially to get the help you need in your marriage, but it will cost you much more if you go through with a divorce. According to a substantial research report on marriage, people who are dissatisfied with their marriage and divorce are less happy, more depressed, and more dissatisfied with life, than people who are dissatisfied with their marriage and stayed to work it out. In fact, five year’s later, dissatisfied spouses who stayed and worked it out report being happier than any other time in their marriage, while dissatisfied spouses who divorced and remarried were frequently dissatisfied in their new marriage. In other words, you are more likely to be happily married in five years if you stay and work it out than if you leave and remain single or remarry. Find a minister, Christian counselor or coach to help you and your spouse begin the road to creating the marriage that you have always wanted. Give us a call and let us help with one of our Marriage Intensives. May God bless you as your pursue the blessings he has for you in your marriage. We always love to hear from our readers. What are some other reasons you should stay and work it out in your marriage? What advice would you give a dissatisfied spouse to encourage them to stay with it?